Celebrating Singapore Shores! : The most adorable snake in Singapore mangroves! The most adorable snake in Singapore mangroves! Featuring our endearing Dog-faced water snake, as we celebrate the start of the Lunar Year of Dog! Googly eyed snake of our mangroves. And some other fascinating snakes in our mangroves! 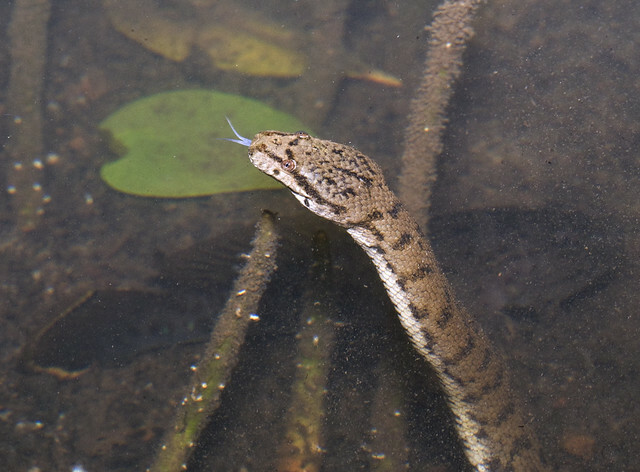 How did the Dog-faced water snake get its common name? Perhaps because, unlike most other snakes, its eyes of pop out of its head! So it can peep out of the water while most of its body remains hidden in the murky water. As this video illustrates. 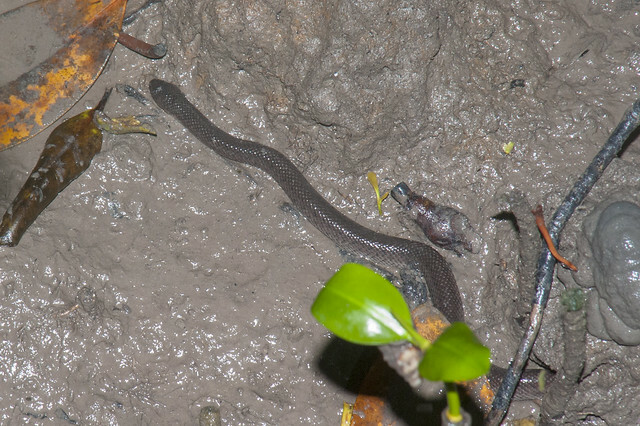 Dog-faced water snakes are very common in our mangroves but rarely seen. They are more active at night, usually staying well hidden during the day. They are well camouflaged, blending in with the mud and the leaf litter. They eat mainly fishes. As soon as the sun sets, these snakes come out to hunt. The snake might lie motionless among a tangle of roots, its body in S-shapes, ready to strike out at any suitable prey that wanders nearby. Or it might move about slowly among the mangrove roots, checking out burrows and bolt-holes to see if there is something tasty hiding there. The prey is swallowed whole. They've been seen catching and swallowing rather large fishes. It can catch and eat large fishes too! 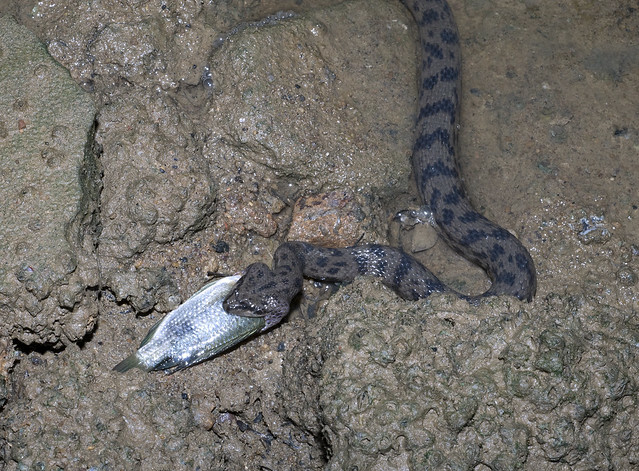 Another commonly encountered snake in the mangroves is the Shore pit viper. 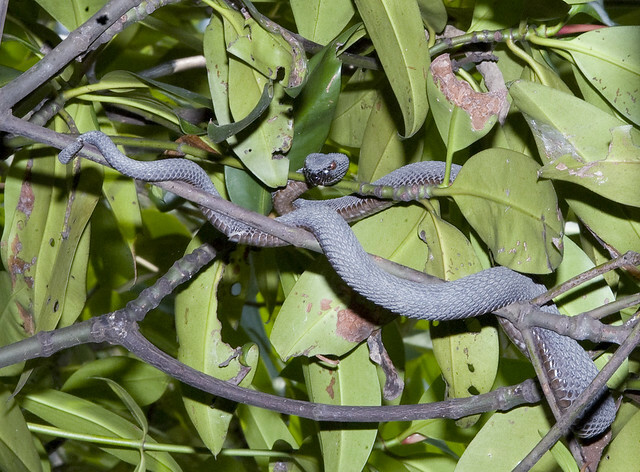 This shy snake looks just like another branch in a mangrove tree where it usually lies coiled and motionless. It is more active at night. It has the typical broad triangular head of a viper and large red eyes on a rather angry looking face. The Shore pit viper feeds on lizards, frogs and other small animals, possibly small birds. It has heat-sensing pits on its lips to detect its prey. 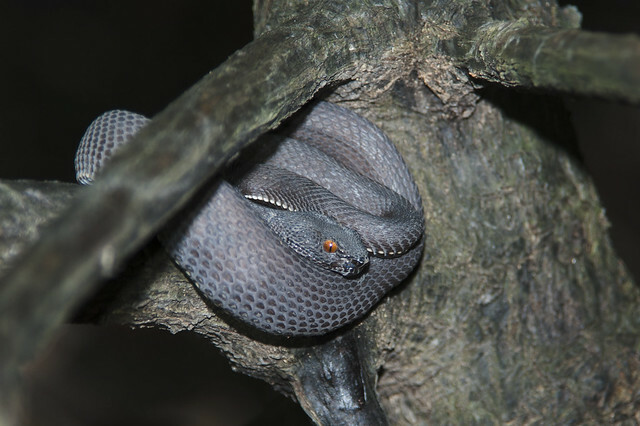 Like other vipers, it has a prehensile tail and can grip a branch to hang on while it whips out the rest of its body for the lethal bite. This venomous snake can strike far and rapidly and can be aggressive. So please do leave it alone. It can grip the branch with the tip of its tail. 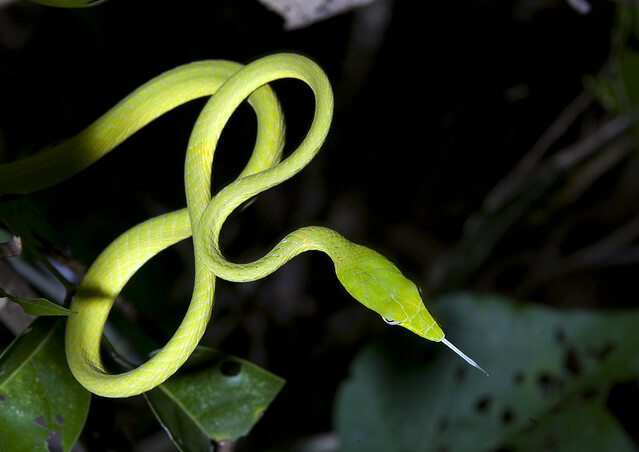 This elegant snake lives in bushes and trees. It is commonly seen on the edges of mangroves and not so much in the mangroves itself. it is often overlooked as a green vine. It is active during the day as well as at night. It eats mainly lizards, but also frogs and small birds. It has a stripe through its eyes that gives it a sleepy look. It looks just like a green vine. A less commonly seen mangrove snake is the Crab eating water snake. It is usually found near mud lobster mounds. It eats mainly hard-shelled crabs, hunting for and capturing them in the crab burrows. It also eats small fishes. 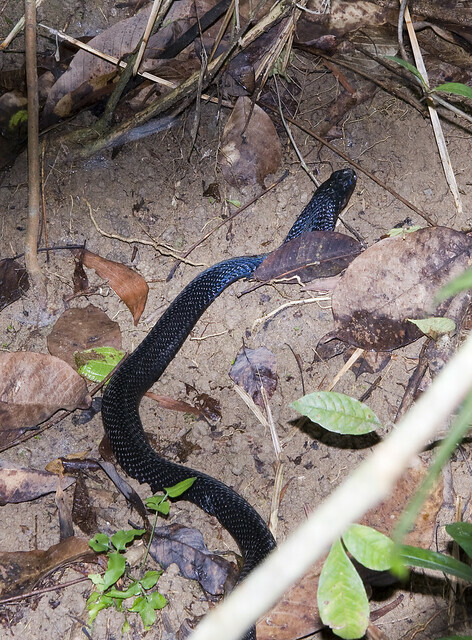 The Black Spitting cobra is sometimes seen in our mangroves and shores. This snake prefers to disappear when it senses humans. If it does stand erect and expands its hood, it means you are not giving it space to escape and it feels threatened. This snake can spray venom into your eyes and bite, so please give it respectful distance. All snakes will not harm humans if they don't feel threatened. Admire them from a respectful distance and let them go about their business. Where can I see mangrove snakes? Snakes that active during the day like the Oriental whip snake can be easily seen at all our mangroves. Pasir Ris Mangrove Boardwalk is open 24/7 and is thus a great place for spotting the other snakes which are more active at night. 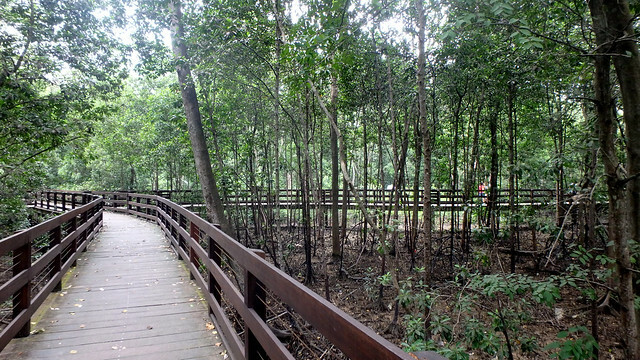 The Pasir Ris mangrove boardwalk is great for snake spotting. Join the Herpetological Society of Singapore (HSS) walks to spot and learn more about Singapore's snakes and other reptiles, amphibians. Shore snakes on the wild facts sheets. 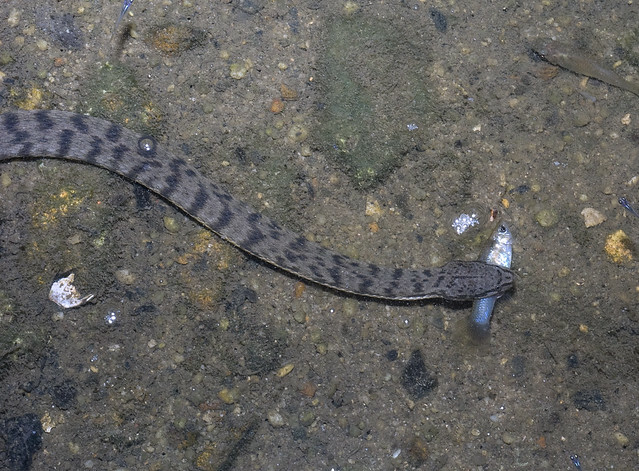 Snakes of Southeast Asia on Ecology Asia by Nick Baker. Labels: mangroves, shore highlights, singapore got marine life meh?